In 1402, the March of Brandenburg gave the New March (Neumark) in pawn to the Teutonic Order, which kept it until Brandenburg redeemed it again in 1454 and 1455, respectively, by the Treaties of Cölln and Mewe. Though the possession of this territory by the Order strengthened ties between the Order and their secular counterparts in northern Germany, it exacerbated the already hostile relationship between the Order and Poland-Lithuania. In March 1407, Konrad died from complications caused by gallstones and was succeeded by his younger brother, Ulrich von Jungingen. Under Ulrich, the Teutonic State fell from its precarious height and became mired in internal political strife, near-constant war with Poland-Lithuania, and crippling war debts. In 1408, Letzkau served as a diplomat to Queen Margaret I and arranged that the Order sell Gotland to Denmark. 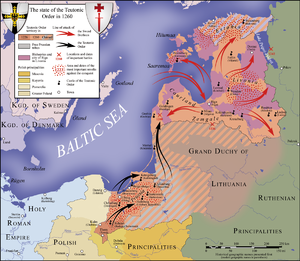 In 1410, with the death of Rupert, King of the Germans, war broke out between the Teutonic Knights, supported by Pomerania, and a Polish-Lithuanian alliance supported by Ruthenian and Tatar auxiliary forces. Poland and Lithuania triumphed following a victory at the Battle of Grunwald (Tannenberg). Dollinger, Philippe (1998) . Hans Krabusch and Marga Krabusch (trls. ), ed. Die Hanse (La Hanse (XIIe-XVIIe siècles, Paris, Aubier, 1964) (in German). 371. Stuttgart: Kröner: Kröners Taschenbuchausgabe. ISBN 3-520-37105-7.